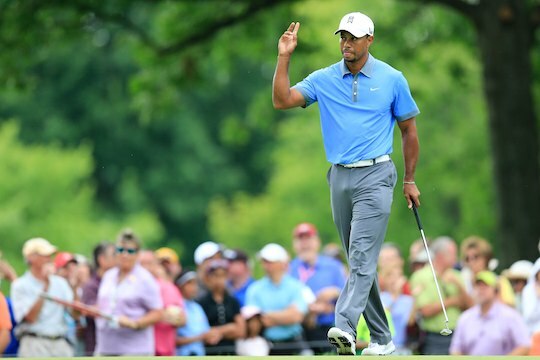 Tiger Woods nailed his birdied putt on the final hole at Firestone Country Club for a second round 61 in a fitting end to one of the best rounds of his illustrious career. The world number one has seized a seven-stroke tournament lead with rounds of 66-61, the second-round 61 matching his top PGA Tour score and tying the course record. The nine-under effort puts Woods at 13-under through 36 holes at the Bridgestone Invitational, where Woods is a seven-time champion. The impressive performance featured seven birdies, one eagle and no bogeys. “I had it going today, it was a nice start,” said Woods in his post-round television interview. Woods was close to the magical ’59′ and later admitted he knew he was in the making of a stellar round towards shooting the magical number. “I certainly could have done it, I’ve done it before [in practice],” said Woods about firing a 59. Keegan Bradley is in a tie for second along with England’s Chris Wood and both will need solid closing rounds to dent Wood’s seven shot lead. Adam Scott is the best of the Australians currently in a tie for 25th position after opening with a disappointing 73 to follow that with a second round 68 to move twenty-nine places up the leaderboard to be at 2-under. Jason Day is in a tie for 59th position at 6-over with Brett Rumford at 10-over-par and in a tie for 71st position. Daniel Popovic has fired rounds of 79-77 to be 16-over for the event and at the bottom of the field. Woods has now shot 61 four times and will take some stopping on a layout he is at home with. First round leader Webb Simpson tumbled down the leaderboard with a second round of 75 to be at 1-under through 36 holes. Rory McIlroy is 1 over after shooting a second round 71. Phil Mickelson, who won the Open Championship two weeks ago, is 3 over after shooting 71 in the second round. Is Tiger almost out of the Woods?